"This is easy as pie... no pun intended. The smokey flavor from the wood fire puts a great twist on an old favorite and with the help of a pizza stone, doing this over an open fire is easier than you may think." You can make a calzone just as easy. Roll out your dough. 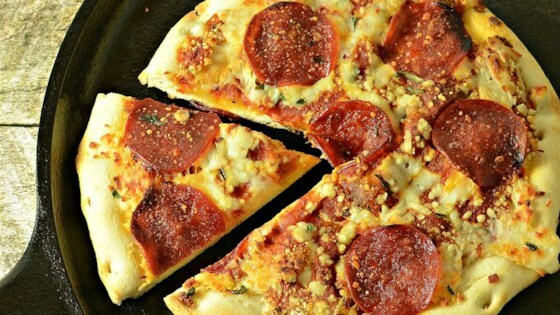 Spread pizza sauce over dough, then add cheese and fillings. Fold the pizza in half, forming a "half moon". Then begin rolling and pinching the edges together starting at one corner and working your way to the other corner. The fillings should be sealed tightly inside the dough. Carefully place it on the pizza stone. Cover with a foil tent. Cook approximately 15 minutes, or until browned. Flip calzone over and cook the other side until well browned. Be sure to cover well with a foil tent during entire cooking process to help keep the heat in and bake the calzone.